Our panel of non-experts weigh in on this week's news events in a parlor game to gauge what kind of week America had. Joining us on this week's panel are: Nancy French, author of "A Red State of Mind"; comedian Dana Gould; and John Ridley, editor in chief of www.thatminority thing.com. 1. Obama Wins. Good news, bad news, or no news? 2. The McCain camp turns on Palin. With the election over, people from within the defeated McCain campaign are harshly criticizing Sarah Palin. They say she thought Africa was a country and not a continent, that she didn't know which countries were involved in NAFTA, and that she didn't prepare at all for the infamous Katie Couric interview. Is this still-anonymous sniping good news, bad news, or no news? 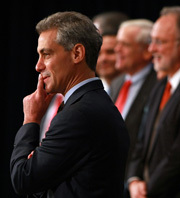 Immediately following the election, the Obama administration began to take shape with the hiring of Illinois congressman Rahm Emanuel to be White House Chief of Staff. Emanuel is known for a tough, hard-nosed style. He's been a powerful figure in the House and was thought to be in line to be speaker. He also goes way back to the Clinton administration. What kind of news is that hiring?